THE desperate parents of a NINE STONE three-year-old have told how they can't make the giant toddler diet because they are scared of him. 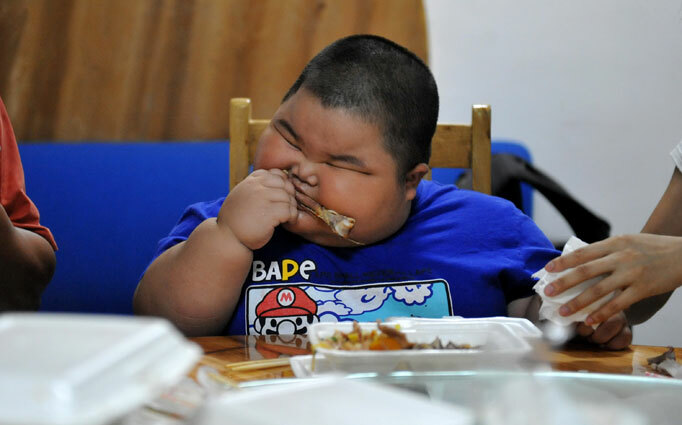 Lu Hao, from China, is dangerously overweight, and at 9st 6lb is FIVE TIMES as heavy as other boys his age. 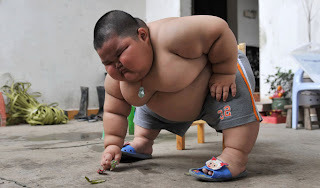 He is getting so big his family are frightened of him â€" and have given up trying to stop the youngster from gorging on huge plates of ribs and rice. His parents claim he throws vicious tantrums if he doesn't get third or fourth helpings of dinner. 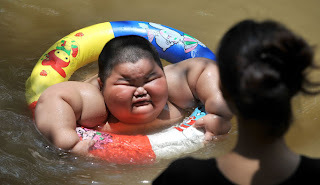 And mum Chen Huan from Dashan, Guangdong Province, admits: "We have to let him be as if we don't feed him he will cry nonstop." She said she has tried to cut down his meals in the past, but despite her best efforts he still managed to put on whopping 1.5st in the last year alone. He has already been banned from nursery over fears his size might be a danger to other children, and usually plays alone at home. But moving around is becoming tougher and tougher for the toddler, whose weight means he gets out of breath easily. 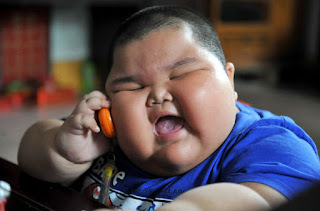 Ironically when Lu Hao was born he was underweight, at 5.7lbs, but he started piling on the pounds at three months old, and hasn't stopped since. 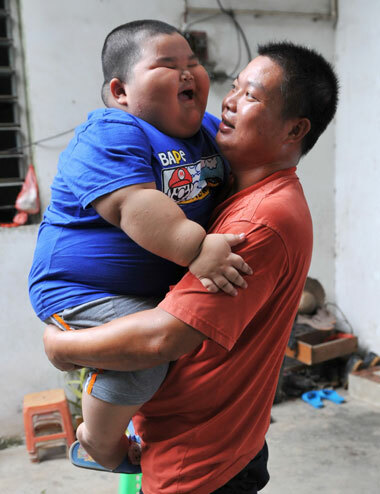 Dad, Lu Yuncheng, who struggles to pick him up, said: "His appetite is so good that for a meal he can eat three big bowls of rice, even larger than I and his mother." 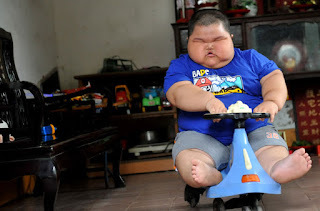 Last year Lu Hao's worried parents took him to see specialists at the Guangdong Children's Hospital. Doctors there said they think it is possible his weight gain could be down to a hormone disorder. 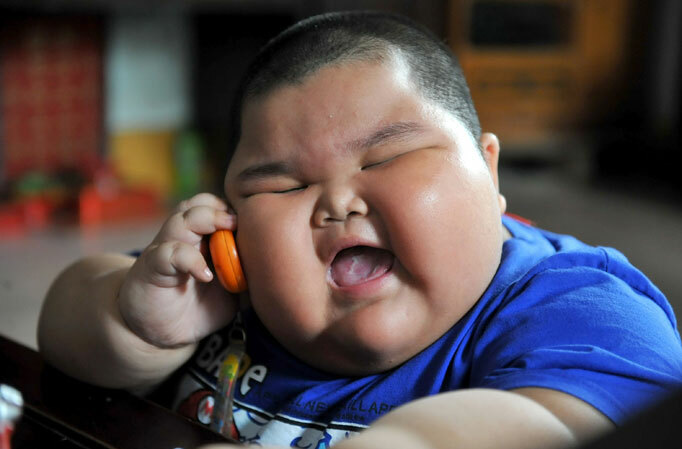 Dr Lu Hong said at the time: "He is not just overweight but very tall as well so we may be able to treat him if it really is hormonal. "But he cannot remain like this or his heart will never stand the strain." A recent government survey showed there are 60million obese people in China, with the number doubling between 1992 and 2002.